Girls pay too much attention on their look at the young age. Barbie and her sister are very popular at the school and they need to keep their look awesome. How about decorating your bag? There are some ways to make it stylish and fancy! 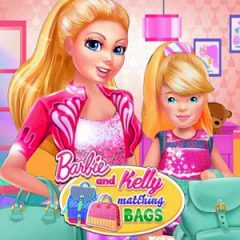 Barbie and her sister Kelly are two fashion girls that love everything fancy and stylish. However, they don't want to look similar to other girls and they will do everything to have unique clothes and accessories. They have done many makeovers to their clothes and even closets, but today they are going to take care of the bags. Help them to choose the proper style for their bags!